Our therapeutic treatments are tailored to meet individual needs. Our experts create treatments tailored to meet individual needs, target specific concerns, and helps to restore optimum skin health. Our detailed skin consultation provides informative treatment options, to ensure maximum benefits for the health of your skin. We proudly use PCA Skin Care products. We ensure the proper products are carefully selected for your skin type, during your treatment or facial. This treatment is 4 treatments in 1. It includes an Enzyme Mask, a layer of Sensi Peel, A Revita-light treatment to drive the Total Strength Serum deep into the skin, followed by, a Retinol treatment, which stays on for lasting results. A consultation determines the appropriate products for your skin. Includes wash, enzymes or steam, extractions, mask, and anti-aging serums with a Vitamin A booster for lasting benefits. 60 Minutes. For clients on the run, a complete facial without the massage. 30 Minutes. We provide treatment and education regarding type of acne, proper skincare, and preventative measures. This treatment is a great introduction on proper skin care for your young adults. Designed for Pre-teens! A gentle cleansing, is followed by a light exfoliation. Steam is used to soften skin and open pores. Extractions are done, if necessary. Next, a relaxing massage is performed on the face and shoulders. To finish, a custom masque, for his or her skin type is applied. After the facial, they will learn the importance of healthy skin and how to take proper care of their skin. A deep cleansing is followed by an exfoliating scrub. Steam is used with PCA’s Detox gel to allow removal of impurities. Extractions are performed, to prevent further breakouts from spreading. Then a custom French clay masque is applied, to absorb any excess oils, tighten, and refine pores. Blemishes are treated with medication designed to promote healing and cell turnover. Clearskin, by PCA, is applied to protect skin and prevent further breakouts. For more information on serious acne ask about our PCA peel. Treatment tailored to specific type of acne. (includes Detox, Extractions & Advanced Revita-light treatment) 45-60 Minutes. Includes treatment and extractions on your back, to keep your back clear and radiant for summer! 60 Minutes. Men’s Ultimate starts with a deep cleaning of the face. Followed by an enzyme peel to loosen dead skin cells, which relieves shaving bumps and irritations. While relaxing with the cooling enzyme peel, reflexology is performed on the hands, which is certain to release tension and stress. 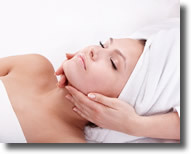 Extractions are performed, if needed, followed by a relaxing massage on the face, neck, and shoulders. A rejuvenating masque is applied. Our masque promotes healing of razor bumps, calms and hydrates the skin. The Forever Young Aesthetics Newsletter is filled with “ageless beauty” skin care techniques, monthly specials on our services, and high quality skin care products!